What is a film director? A man who's asked questions about everything. Sometimes he knows the answers. 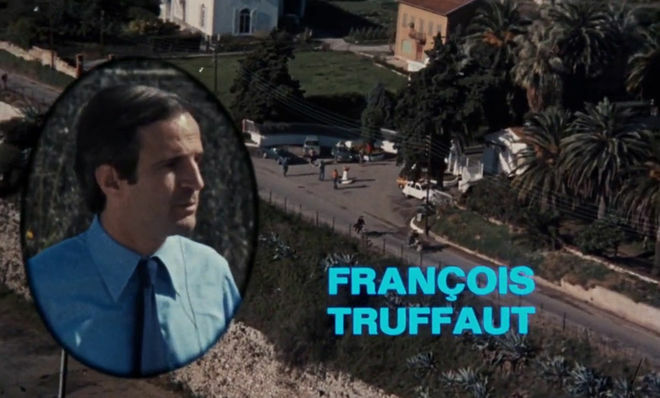 The maestro’s command is also a message from director François Truffaut to the audience about to watch his 1973 filmic farce Day for Night (La Nuit Américaine). The movie is beginning; pay attention. This is a film about filmmaking, a subject that Truffaut matter-of-factly called his “own reason for living.” The movie follows the troubled production of Je Vous Présente Paméla (Meet Pamela), a hokey melodrama about a man (Jean-Pierre Aumont) who begins an affair with his son’s fiancée (Jacqueline Bisset). Actors play actors, crew plays crew, and the director plays the director. 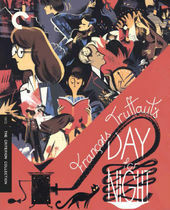 Although the mockumentary nature of Day for Night is not fully revealed until the end of the first scene – when Truffaut, as Ferrand, yells cut – the opening title sequence pulls back the curtain even earlier. An example of 35mm film with a stereo analog optical soundtrack, which appears just inside the perforations on the left side. 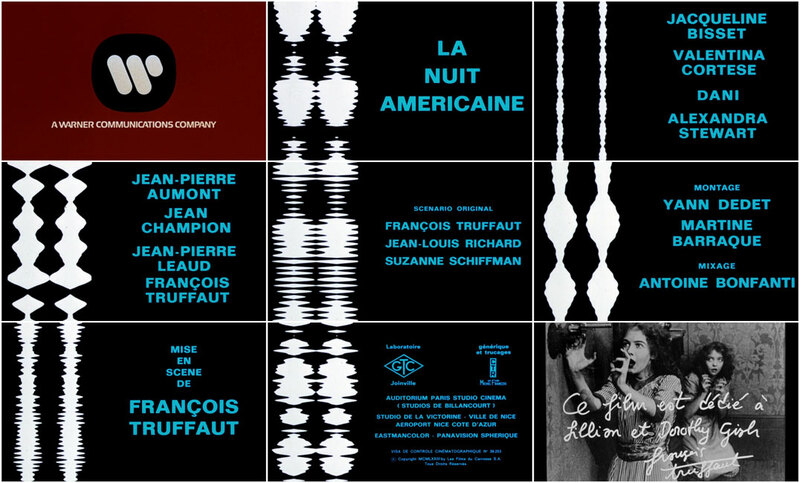 Designed by Michel François, one of France’s most prolific title designers, the Day for Night title sequence features the typeface Folio in a cool blue, listing the cast in alphabetical order – ladies first, of course. As the credits roll, the musical cacophony reveals the unpolished process of the score’s creation. The pulsing waveforms in the left third of the screen – a facsimile of the film’s analog optical soundtrack – peel back another layer, a projection of how the technology of cinema boils down the dialogue and music. Even the film’s title, Day for Night, is a reference to the filmmaking process. As its name suggests, day-for-night shooting is a technique used to simulate nighttime while filming in daylight. “La nuit américaine” is simply the French term for this technique. American director Brian De Palma, an avowed fan of Truffaut, crafted a similar self-referential opening for his 1981 film Blow Out, replacing the orchestra with a beating heart and bloodcurdling screams. The Day for Night sequence caps off with a still of silent era movie stars Lillian and Dorothy Gish from D.W. Griffith’s 1912 film An Unseen Enemy, and a handwritten dedication from Truffaut to the iconic sisters. From start to finish, the film’s opening is a love letter to the art and artists of cinema.